Jewelry beading on leather cord pendants is a great way to quickly design a simple necklace. Leather jewelry has a natural look with widespread appeal. 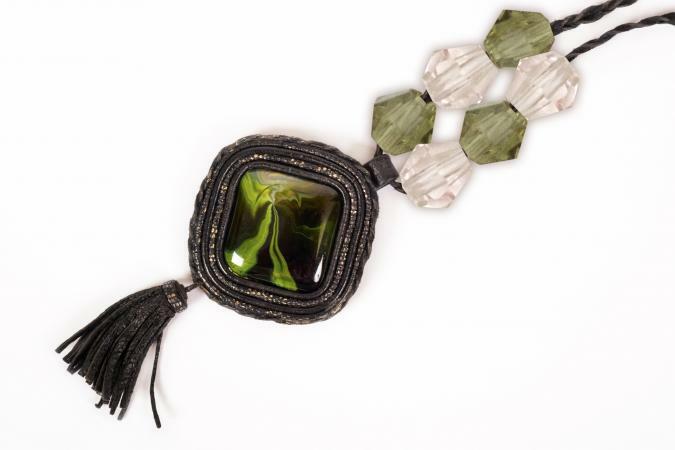 In Native American cultures, people traditionally wore leather jewelry to bring them good look. Today, crafters enjoy experimenting with this versatile material to create hip and stylish fashion accessories. Leather cord is generally available whenever beads and other jewelry making supplies are sold. It is often sold in a roll and available in many different widths and colors. Thicker cord is generally best for single strand projects, while thinner cords are preferable for intricate designs that involve braiding or weaving. When buying leather cord for your projects, however, it's important to remember that some types of dyed leather will bleed when wet. To avoid accidentally staining your neck, test a small piece of the material before completing your project. While it's certainly possible to finish a leather cord necklace by simply knotting the ends of the cord, adding a clasp gives your piece a much more professional look. If you're planning to start your own jewelry making business, you may want to keep in mind that some people have ethical objections to the use of leather for clothing or fashion accessories. Fortunately, it's easy to achieve create similar looking designs by using substitutes such as waxed linen, cotton, rubber, or hemp. Although making your own pendant may seem like a difficult proposition if you're accustomed to working with pre-made accents, the basic technique involved is actually quite simple. Choose one large focal bead or a large bead and a few smaller beads for your jewelry beading on leather cord pendant project. String the beads onto a large headpin. Make a 90 degree bend approximately two inches from one end of the wire. Use round nose pliers to hold the wire near the angle of the bend and bend the short end up and around until the wire meets itself. Wrap the tail securely down the stem of the pin to make two or three coils. Use wire cutters to trim the excess wire. Use round nose pliers to make a small loop at the end of the wire. Enlarge the loop by holding onto middle with chain nose pliers and pushing the wire around the loop with your thumb. Let go of the chain nose pliers and reposition the spiral within the jaws to draw the wire over the previous loops. Domino Art Pendant: Add a vintage image to an old domino piece to create an artistic looking pendant. Photo Transfer Pendant: Transfer old family photos onto polymer clay to design meaningful keepsake jewelry. Blue Flat Stone Necklace: Design a hip necklace with a simple, graphic look. Melted Glass Art Pendant: Although this beautiful pendant looks complicated, it's surprisingly easy to create.